(MENAFN - Gulf Times) As a boy, Francisco Ramirez Cruz loved hiking with his grandfather up into the mountains of central Mexico. While the old man grazed sheep or hunted for wild mushrooms, Ramirez would play amid the throngs of monarch butterflies that migrated 3,000 miles to this forest each autumn, turning the blue sky into a sea of orange. The world is losing monarch butterflies at a startling rate, as logging, herbicides and other human activities destroy natural habitats. But the biggest threat yet has only recently come into focus. Climate change, with its extreme storms, prolonged droughts and warming temperatures, is poised to eradicate the forest that serves as the butterfly's winter refuge. In the last two decades, the population of monarchs overwintering in Mexico has declined from an estimated 1 billion to fewer than 100 million. If they go extinct, it would mark the loss of one of the world's few migratory insects. In the United States, conservationists have petitioned to have the monarch protected under the Endangered Species Act; a ruling is expected this year. On one of the scientists' early scouting trips to the region several years ago, locals suggested they meet Ramirez, a respected farmer with graying sideburns and a thin moustache who lives on a windswept hillside in Ejido La Mesa, a community that overlaps with the Monarch Butterfly Biosphere Reserve — a national park 70 miles west of Mexico City. Known by the honorific 'Don Pancho, Ramirez is a former elected leader of La Mesa and is hailed as a hero for helping to bring electricity to the area in the late 1980s. Most importantly, he knows the forest intimately, thanks to the time he spent there, starting in the 1950s. 'In the early days, we didn't know where they came from, said Ramirez, who talks the way he moves — slowly and deliberately. 'But we have always been so happy to see them. 'It's an idea that may sound radical, said Saenz-Romero. 'But by the end of the century it may be absolutely needed. The trees, known as 'sacred firs because their conical shape calls to mind hands clasped in prayer, offer a dense canopy that acts as an umbrella for the butterflies that cluster by the thousands on their trunks and branches. The oyamel protects the butterflies from chilly winter rains and creates a microclimate cold enough to keep the butterflies in a state of hibernation but not so frosty as to kill them. The region is warming at such an accelerated pace that the trees won't be able to adapt, scientists say, and will need help migrating to areas where the climate is predicted to be suitable for them in future years. 'We have to assist them, said Saenz-Romero, a professor at the Michoacan University of St. Nicholas of Hidalgo. 'They cannot do this themselves. In the middle of Ramirez's orchard of apple and plum trees, the scientists helped him construct a small greenhouse, where he tends to several dozen saplings that were taken from the forest and will eventually be replanted. On a recent blustery morning, he watered the trees with a hose while listening to the sentimental ranchera songs drifting from the house of a nearby neighbour. Then he slowly folded himself into the passenger seat of Saenz-Romero's silver pickup truck, and they headed up the mountain to check on the trees that had already been planted. They made an unlikely pair — the farmer in a straw cowboy hat and the city-dwelling scientist in a jaunty black beret — but on the 45-minute drive on a rutted dirt road, Ramirez and Saenz-Romero made easy conversation. They talked about a mudslide years earlier that had killed several people and taken down many fir trees, and they discussed the rain (there hadn't been any recently). Ramirez and the scientists are learning what the trees need to survive. They have found, for example, that trees are more likely to live if planted under the shade of nearby 'nurse plants. They hope to expand the project and establish the trees at even higher altitudes on other nearby mountains — seeding ecosystems now that monarchs could potentially use later if temperatures continue to rise. So-called assisted migration is happening in other parts of the world, including Canada, where commercial forestry operations have begun replacing dead lodgepole pines with a species of larch that grows at lower and drier elevations. Plant moving is controversial among some scientists, who warn of unintended consequences when humans intervene in nature's course, but it is increasingly seen as a needed response to a rapidly changing climate. 'There's no doubt that things are going to change, said Chip Taylor, a retired ecology professor in Kansas and the director of Monarch Watch, which runs a butterfly tagging program. The experiment in Mexico, if successful, is a short-term solution, he said. But it's an important one. 'What these measures do is give us time to address climate change, he said. 'If we don't do something eventually about CO2s, eventually the new trees will be pushed off the mountain too. La Mesa and the surrounding areas haven't contributed many of the greenhouse gases that are transforming the climate. In fact, in many ways the region feels stuck in a previous century, with dusty burros that trudge up the pocked two-lane highway, firewood piled on their backs, and shepherds reclining in green pastures, one eye on their flocks. Ramirez's wife, Petra, whom he met half a century ago at a Day of the Dead celebration in a nearby town, still cooks her chicken mole in a pan over an open fire. Over the last couple of decades, the area's agriculture industry suffered, partly because of warming and partly because of competition brought about by the North American Free Trade Agreement. Family-run corn and potato farms, which used to blanket the hillsides, couldn't compete with US agribusiness. Ramirez stopped planting corn because it became cheaper to buy it. For many years, he lived in Mexico City and worked in construction. 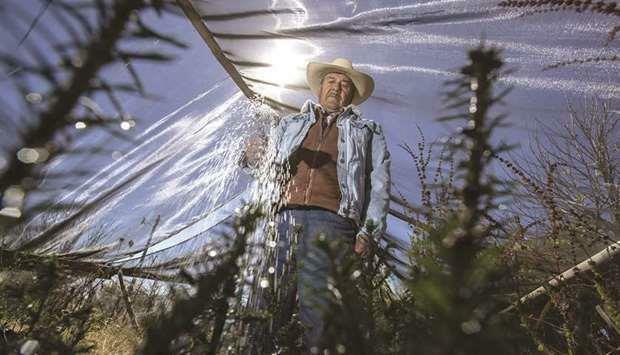 As jobs dried up, many locals had to migrate, just like the monarchs do. That included two of Ramirez's sons, who toiled for a time in the United States, and several other family members who still live there. In a small chapel his father built on the farm, Ramirez and his wife keep fresh flowers and a framed picture of Toribio Romo Gonzalez, a Catholic saint known as a protector of immigrants.